An open bar can be fun at a wedding, but keeping the bar open all night for your guests is not how to keep catering costs down. Instead consider having an open bar for a few hours and then closing it once dinner is over and the dancing starts. Guests will be happy with a few free drinks through dinner. The type of food can also keep wedding catering prices down as serving less heavy food rather than a lot of light food that will not fill up the guests can save significantly, as less food will need to be prepared. Consider pastas and carb heavy dishes. Instead of plated courses try a buffet. This will cost less as it cuts out the cost of labor because fewer servers are needed. Less expensive local wines can be just as good as fancy French wines. Consider going with the cheaper option as many guests will have trouble knowing the difference between what is expensive and what is not. Hors d’oeuvres don’t need to be expensive as they are just way to keep guests satisfied before the real festivities begin. Having something like mac & cheese shooters instead of shrimp cocktails will both be a fun tasty treat and help keep food costs down. The less people the less food you’ll need to serve. This might seem like an unfriendly way of cutting catering costs at a wedding but it might be necessary to stay within budget. Weddings should be about close friends and family celebrating so consider if mom’s lawyer’s brother-in-law really needs to be there. Quality cuts of meat are going to cost a lot more and are going to bring the cost for food up by a significant amount. Using cheaper cuts doesn’t mean the meat is bad quality, so consider switching to another cut to keep prices down. Is it really important that there’s a salad and an appetizer? Consider just having a salad as the appetizer and cut costs of food prep and labor. Breaking out the champagne just for toasts can be a costly and unnecessary addition to a ceremony. On top of the uncorking fee, most of it will go wasted as people will switch back to their preferred alcohol once the toasts are over. The right caterer will work with you not against you. 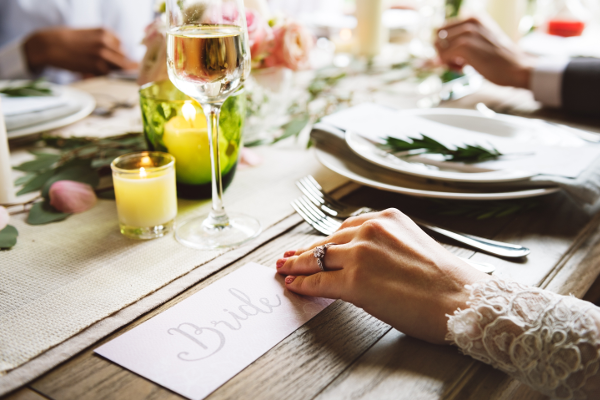 It is important that the caterer both understands the budget and the vision and is willing to make it work with the resources they have to make the wedding special.